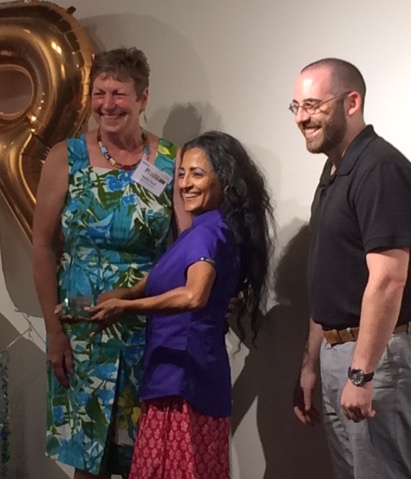 The Metropolitan Regional Arts Council (MRAC) selected Ananya Dance Theatre and the Caponi Art Park as recipients of the 2016 MRAC Arts Achievement Award. The awards were presented by Amy Crawford, executive director, and Peter Leggett, board president, during MRAC’s annual meeting, July 26, held at the Soo Visual Arts Center in Minneapolis. Ananya Chatterjea, artistic director, accepted the award for Ananya Dance Theatre. Cheryl Caponi, executive director, accepted on behalf of Caponi Art Park. MRAC’s Arts Achievement Award recognizes two organizations each year that exemplify its mission of increasing access to the arts in the seven-county Twin Cities metropolitan area.